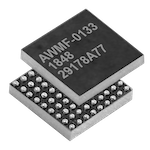 The AWMF-0133 is a highly integrated silicon quad core IC intended for satellite communications transmit applications. The device supports four dual polarization radiating elements with full polarization flexibility. The device provides 20 dB of gain per channel with an output power of +8 dBm per element per polarization. Additional features include gain compensation over temperature, temperature reporting, and Tx output power telemetry. The chip features ESD protection on all pins, operates from a +1.2 V supply, and is packaged in a 4.4 x 3.6 mm WLCSP (Wafer Level Chip Scale Package) for easy installation in planar phased array antennas.